The cellular services industry in India has grown at a scorching pace in the last ten years, to become one of the fastest growing mobile services market in the world 1. Increasing competition has benefitted customers immensely with increased choice for service providers and some of the lowest tariffs in the world 2. But this rapid change has also resulted in several problems for consumers such as deteriorating Quality of Service (QoS), increased electromagnetic radiation levels and customer dissatisfaction over plan information. Till 1995, the telecom sector used to be a government monopoly and was regarded as key basic infrastructure sector of the country 3. A telephone connection then was considered a luxury- with waiting time for a new connection sometimes stretching to several months. Due to this, the tele-density levels in the country were abysmally low. As part of the liberalization, the telecom sector was opened up for private operators in 1995. Since then, the government has, through its various bodies, particularly the industry regulator - Telecom Regulatory Authority of India (TRAI), tried to ensure that telephony becomes easily accessible to everyone in the country. A brief timeline of telecom policy evolution is given in Exhibit 1. Over the last 15 years, cellular telephony has marched ahead to achieve this vision of government. In fact, we reached the Government's target of 500 million telephone connections at the end of 2010 by September 2009 itself4. Further, out of the 509.3 million telephones in India at the end of September 2009, mobile subscribers form a staggering 92.5% 5. Cellular subscribers, especially in urban areas, have benefitted from the increased choice in operators and from falling call rates, which are amongst the lowest in the world. However, with the changing dynamics of cellular service industry in the last 10 years, customers are also facing a number of problems. Some of the key customer problems and their possible solutions are discussed ahead. The analysis of the popular plans of major cellular service providers as shown in Exhibit 2, establishes that cellular service has become a commodity now. Service providers are trying to attain "economies of scale" by targeting the consumers at the bottom of the pyramid through the introduction of innovative schemes such as micro-recharge, lifetime prepaid, per second billing etc. As shown in Exhibit 3, this has resulted in an increase in revenue for service providers, but their ARPU has been falling constantly 6. Multiple issues plague the telecom industry and growth in the country, and the following are suggested corrective measures in order to stem the rot in the sector. One of the major consumer issues is increased network congestion and the consequent Quality of Service (QoS). This problem is particularly exacerbated in densely populated parts of cities and during peak times. The principal reason for this problem is that the service providers have not scaled up their telecom network infrastructure in proportion to the increased network usage. The latter is a direct consequence of the increased number of subscribers and increased number of calls made by these subscribers 7. Cellular service providers, further, have not given due importance to this issue as the basis of competition in this industry in India is pricing and not QoS. This allows the service providers to try and increase their subscriber base as much as possible without investing enough in network infrastructure. The Mobile Number Portability (MNP), wherein a subscriber can retain his/her existing mobile number, while switching from one service provider to another by paying a nominal fee, is a step in right direction by the government to address this issue. MNP, which is expected to be implemented in India from the first half of 2010, will shift focus of competition from just pricing to a combination of pricing and QoS. A more radical solution to this issue would be to allow subscribers to temporarily select their service provider even on the home network. Presently, subscribers have the option to choose the network of some other service provider when they are outside the network of their service operator. For example, if an Airtel subscriber goes out of his home circle into a circle where the Airtel network is not available, then he can choose from amongst the existing service providers present in this new circle. If this facility is extended to the home circle as well, a subscriber can then choose a service provider who can provide the best QoS in that particular area. This could be termed "Home Roaming", with the service charges being settled by the companies at the backend without the subscriber coming into the picture. TO draw a close parallel, Bank ATMs follow a similar system, where a customer can utilize an ATM of any bank based on his convenience. The larger number of subscribers and service providers has led to the mushrooming of telecom towers, especially in metros and big cities. These towers contain mobile base station equipment, which produces 900 and 1800 MHz pulsated waves. This has increased the electromagnetic contamination- referred to commonly as "Electrosmog" in urban centres. A number of scientific studies have been done which warn us about danger posed by this electromagnetic contamination to the health of humans and other living beings 8. The main reason for this is that cellular service licences have been given to multiple service providers on the condition that they set up their own towers. With an estimated 2.5 Lakh more telecom towers to be rolled out across India in FY 2009-10 9, this problem is only set to deteriorate. Recent steps taken by Department of Telecommunications (DoT), which allow active and passive infrastructure sharing among service providers, are measures in the right direction 10. But the government needs to come up with tighter regulations for setting up telecom towers. The radiation emitted from the towers should be measured and permissible limits must be decided. Approval for a new tower in an area should only be given after submitting the permitted radiation report for that area. A similar system has been adopted in Australia where every tower owner has to submit details about compliance to the radiation norms both before and after the setting up of tower 11. Another possible solution is for government to prepare a "Zoning map" of the landscape and come up with a plan for sites available for setting up the telecom towers as public/shared infrastructure. The space on these towers can then be auctioned to cellular service operators who already have a license to operate in that particular area. Cellular service providers in India keep coming out with new schemes and plans to attract and retain customers. However, on most occasions, the details of these plans are not disclosed upfront to the customers and often discrepancies emerge between actual plan details and the customer's understanding of them. These apart, service providers are often accused of changing the terms and conditions without the prior consent of customers. This leads to a lot of confusion, and the customer invariably feels cheated when any discrepancy is seen. The telecom regulator in India, Telecom Regulatory Authority of India (TRAI), on its part has come up with a number of regulations and guidelines for service providers to ensure that customer dissatisfaction is minimized. For example, in its directive dated 29th June, 2005 TRAI has mandated that complete details of the plans including financial implications should be included in the plan brochures available at retail outlets of a cellular service provider 12. The same directive also mentions that a customer must be informed in writing by the service provider, within a week of activation of service, the complete details of his plan. In addition, as and when there is any change in the plan structure in any aspect, the operator has to intimate, in writing, about the changes to the subscriber whose plan is changed. 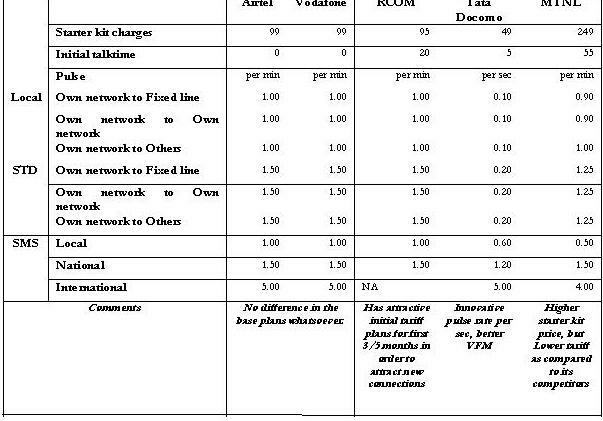 Another directive was issued by TRAI on 16th September 2005 regarding tariff plans with misleading titles 13 . It mentions that any plan which is offered, presented, marketed or advertised in a manner that is likely to mislead the subscribers, would attract regulatory action. It is evident that TRAI has enough measures and regulations in place to protect consumers but the challenge lies in implementing these measures. Hence in order to tackle this issue, TRAI has to come up with strict monitoring and imposition of penalties on erring companies. The Indian Telecom industry is fast transitioning from a growth phase to a maturity phase of the industry lifecycle and the competition will get tougher for the players in the years to come. The impending changes in technology and regulatory policy like 3G and MNP are expected to change the rules of the game in the industry and might even change the industry structure. But the issues faced by consumers in the form of QoS, discrepancies in plans and telecom towers mushrooming everywhere still need to be addressed by the government agencies through proper planning and forward looking policy decisions.